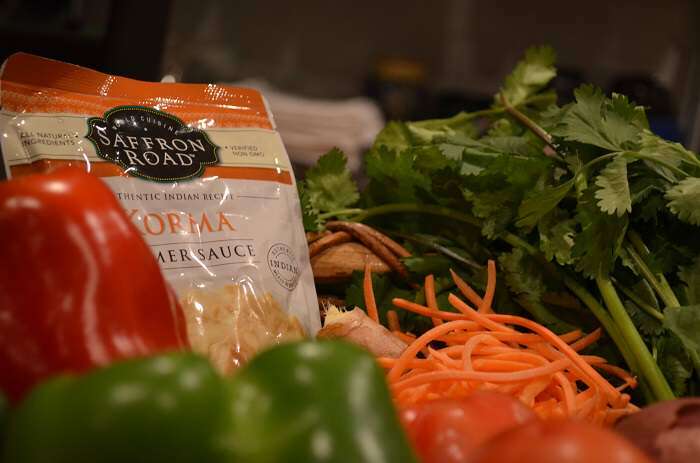 I’ve been cooking with Saffron Road products for a long time now and I really do enjoy them. They actually spoil me- made with high quality ingredients, part of the non-GMO project, many of which are gluten-free, and they’re really, really good. For something that makes your life easier, it’s a relief to find something of such value. The most recent recipe I made with their Korma Simmer Sauce is now one of my new favorites- it’s saucy, crunchy and has a bit of a kick. 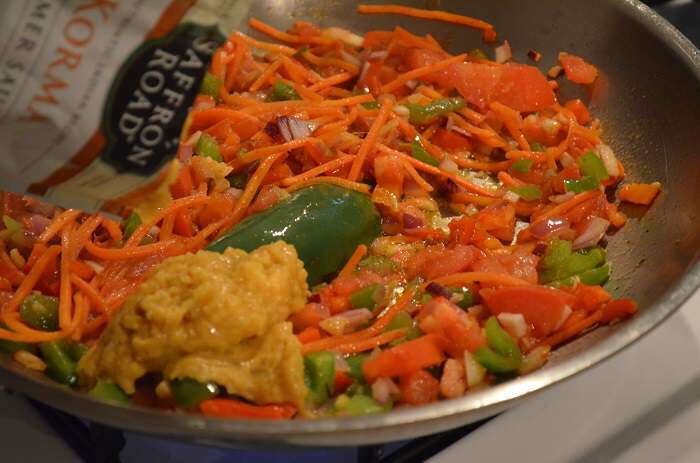 I could concentrate on adding flavors I wanted because I didn’t have to worry about making the Korma sauce, too. That’s what the packet is for, which is nice. Told you I was spoiled by it. I love to add fresh ingredients to these simmer sauces, and most of the time some meat. 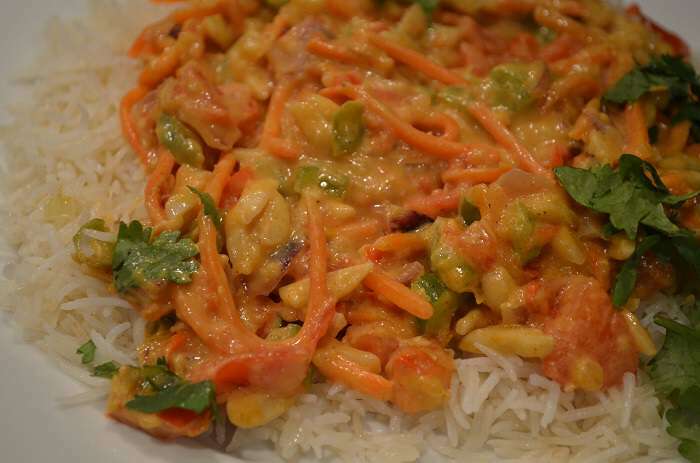 This time I decided to go vegetarian to add to my repertoire of vegetarian dishes. You could add meat- strips of meat or chicken would be delicious here, too. 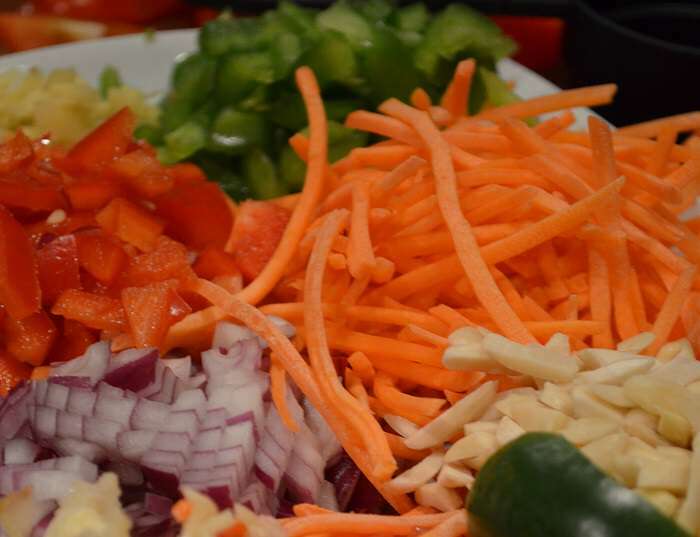 Most of the veggies should be chopped or diced finely, which is what helps the dish cook so quickly. The only thing I didn’t chop up was the jalapeño pepper, which I cut in half and removed the seeds- I only added 1/2 of the pepper to the dish. 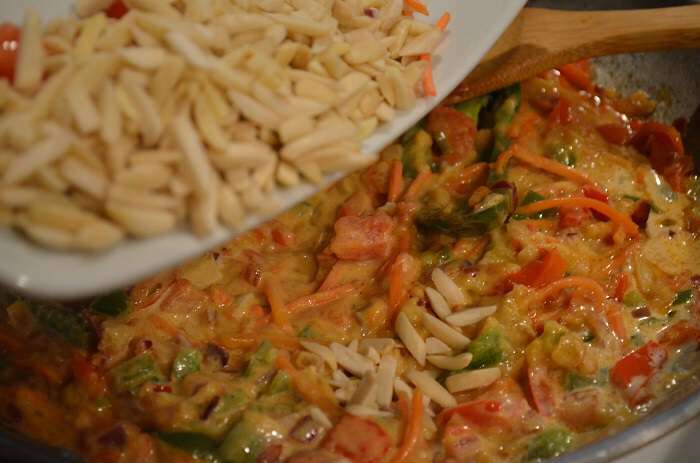 I also add some sliced raw almonds (unsalted) to give the dish some crunch- that was great. The other ingredient I’m so glad was in this dish is cayenne pepper. It really helped to give it a kick, because I like things spicy. 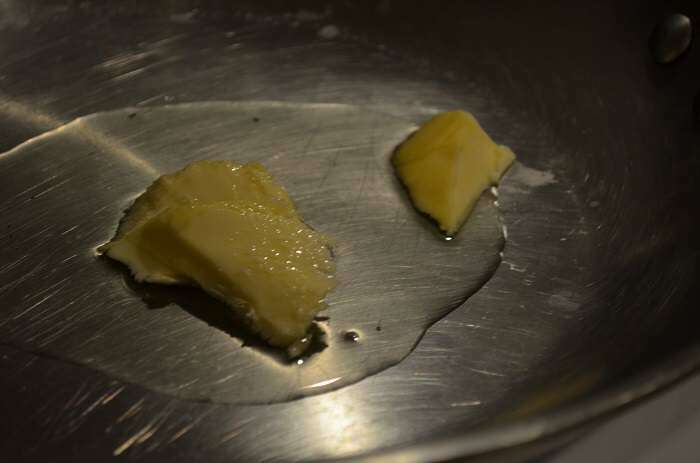 Start off the dish by heating up some butter and grape seed oil. 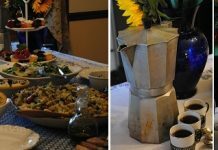 Grape seed oil is more neutral so it won’t flavor the dish; if you choose extra virgin coconut oil then skip the butter. It would actually be a great choice because coconut milk is in the base of the Korma Simmer Sauce. 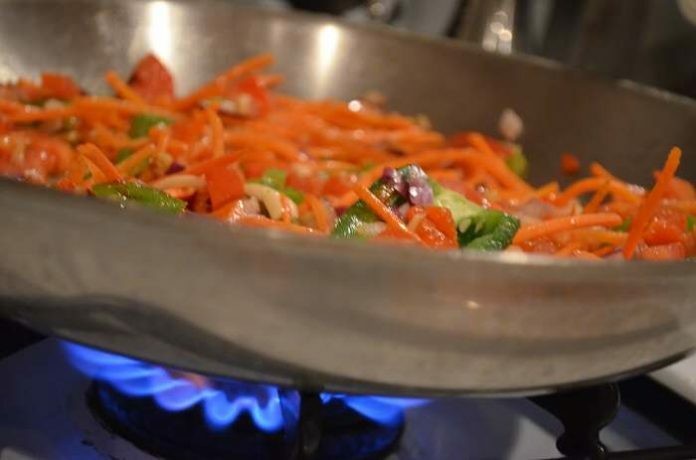 Put the flame on medium-high and let those veggies sear. Don’t worry about the grape seed oil if you’re heating up the pan more as long as the veggies are in the pan (not an empty pan) because they actually help bring the heat down. Once they’ve heated up quite a bit, about 10 minutes- and after adding a bit of seasoning- salt, white pepper and cayenne- then add the Korma Simmer Sauce. It’s probably a good idea to shake up the bag a bit. I didn’t exactly do that, but it’s okay- you can still stir it up. My solution to this is to add some heavy cream, just to smooth it out a bit- this was a delicious idea and pairs nicely with the yogurt and coconut milk base that’s in the sauce already. Stir it in just a bit. 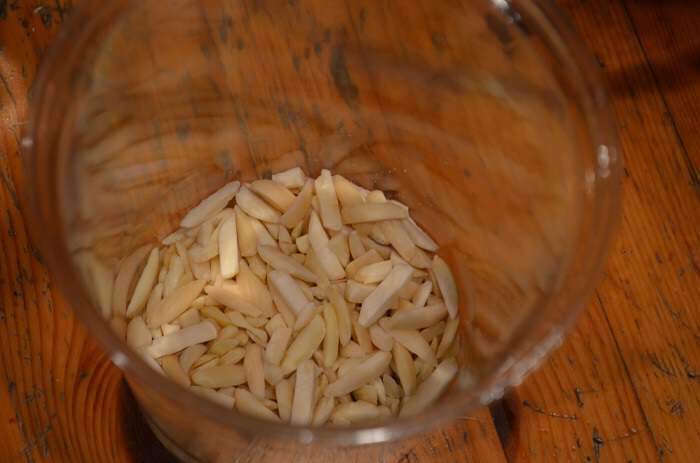 Then add the raw sliced almonds. Stir again. Simmer for about 7-10 minutes- that means on very, very low. You don’t want the mixture to bubble, which will basically burn the cream. Get the rice ready- you should probably do that ahead of time because if you do the sauce first, you probably will have nothing left to eat with the rice. 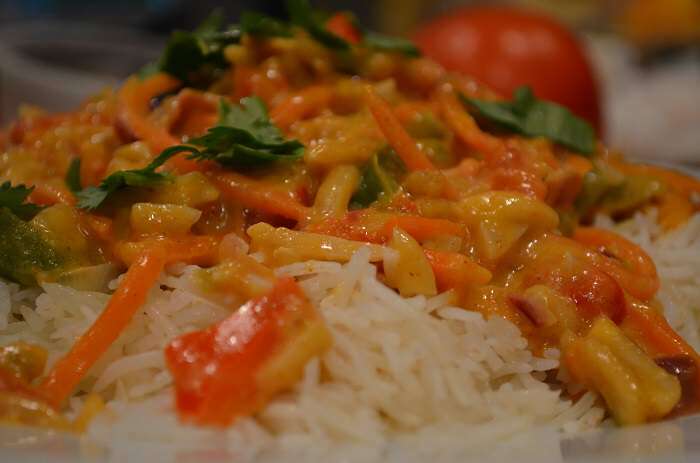 To learn how to make Basmati rice, read my recipe here. It’ll all be gone- between the wafting smells and the tasty bites in between, believe me it won’t be around for long. And I don’t think it’ll taste good with bread. 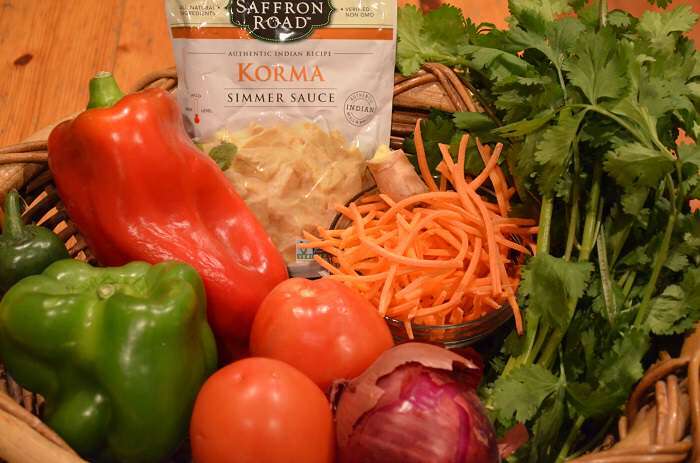 You can get Saffron Road’s delicious Simmer Sauces in a variety of globally-inspired cuisines. They’re available at Whole Foods Markets across the country as well as Cost Plus World Market stores. Check the Saffron Road store locator for more options. Disclaimer: This is a sponsored post in which I was provided a packet of the Korma Simmer Sauce by Saffron Road. All opinions and recipes are my own. 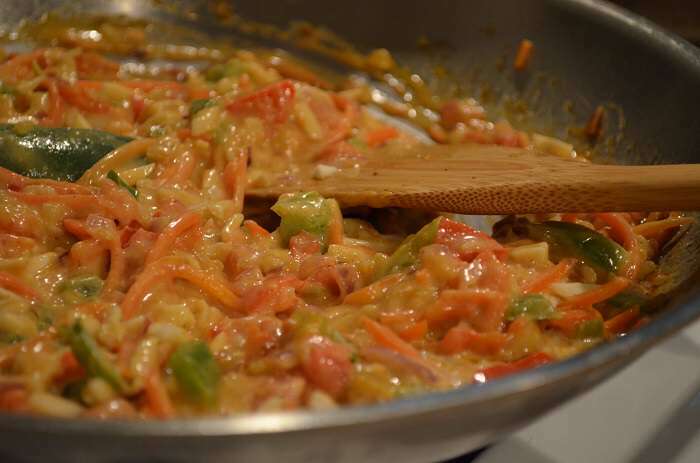 When you feel like making a vegetarian meal in the middle of the week, this is a quick and healthy go-to recipe that can be adapted with a variety of different veggies. 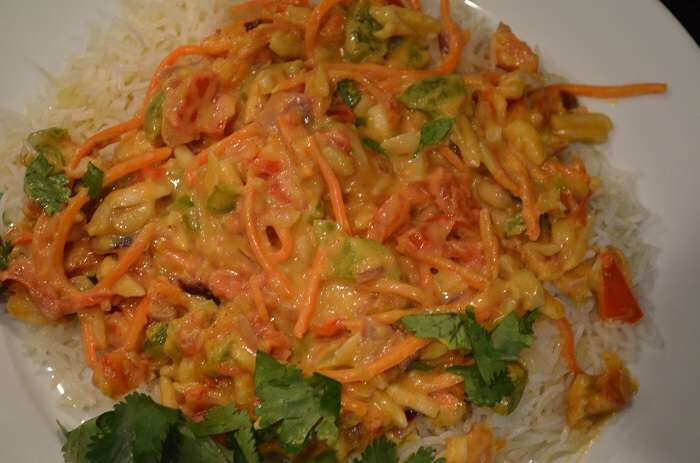 Add chicken or beef strips for a non-vegetarian version. In a sauté pan, heat the butter and oil together gently. Add the garlic and ginger and lightly sauté for about 2-3 minutes. Add the onion and jalapeño and do the same for an additional 2-3 minutes. Add the tomatoes and sauté until they soften. Add the diced peppers then the carrots. Sprinkle the salt, pepper and cayenne. 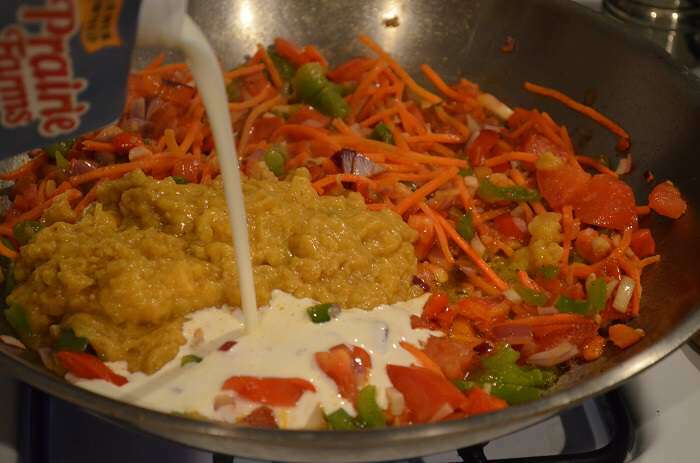 Add the entire package of Korma Simmer Sauce and stir well with all the vegetables. Add the heavy cream and the almonds and stir together completely. 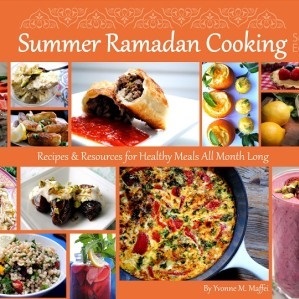 Immediately reduce the heat to a simmer. Continue to cook for an additional 5-7 minutes. 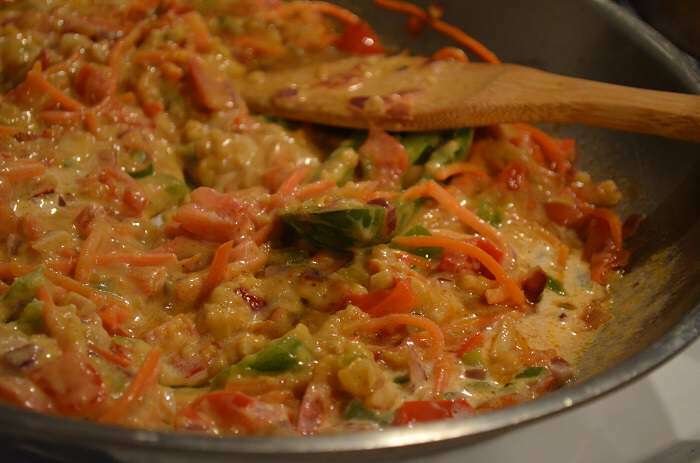 Remove from heat and place a generous spoonful or two on top of a serving of rice. Sprinkle with freshly cut cilantro leaves on top just before serving. About the servings- this recipe serves 2-4, although it might be somewhere in between. We (two of us) were able to knock it out because we liked it so much so it really depends if you'll anticipate seconds. id love to hear back from you. i really want to try their simmer sauces, but all of the ones i looked at contained this ingredient. “The Korma simmer sauce mentioned in this recipe, does NOT include modified corn starch as mentioned in the comments below. What we do use is a Non GMO Project verified native corn starch, meaning it is not modified in any way. We are very conscious of the ingredients we use and more importantly the suppliers we purchase from with regards to ingredients which are controversial in the media. For many decades, corn starch has been used for baking and in soups and sauces, and we make sure to source one that has steered clear of GMO’s since, as you know, we are passionate supporters of The NON GMO PROJECT. Across our brand we specifically only purchase native corn starch for our products because we know it is a concern for savvy consumers. 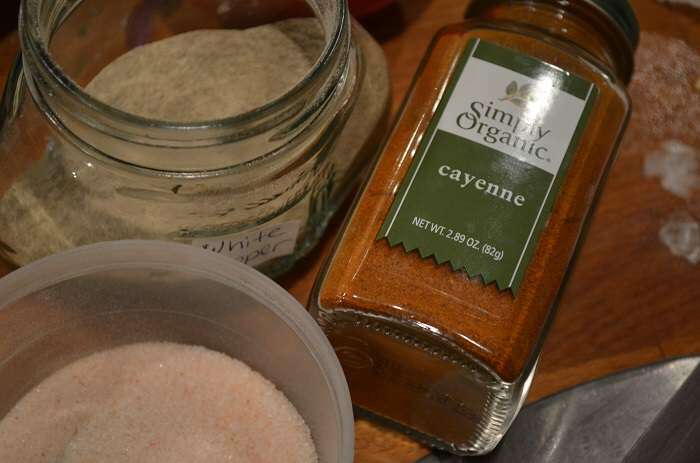 In some of our original simmer sauce products there is a small amount of modified corn starch, and that could be what the consumer is referring to. 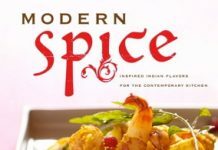 I would like to make it known that now 6 out of the 8 simmer sauces are now Non GMO Project verified; we already have made great strides in recreating the recipe for Lemongrass Basil and Tikka Masala Simmer Sauces to eliminate ingredients that were unnecessary, and to allow it to pass this stringent verification. Rogan Josh and Moroccan Tagine are next in line; it just takes time and patience on our end to recreate the product to match the taste while getting ingredients approved by The Non GMO Project. Is there any replacement for Korma Simmer sauce? It is not available in Saudi Arabia.